SteelSeries Siberia 800: should I buy this gaming headset? Although Steelseries has since moved on from its the Siberia line of gaming headsets to the newer Arctis line, the premium Siberia 800 isn't exactly out of date. In fact, it may still hold decent value for serious gamers who want to use one pair of headphones for all their different gaming platforms – and you might just see a deal for it during Black Friday and Cyber Monday. The Siberia 800 is a wireless gaming headset that connects using a reliable 2.4GHz connection, so you won't have to worry about latency, poor signal, or reduced audio quality. It also supports wired connections if you're on the go, or for certain scenarios that might require it (more on this soon). The Siberia 800 headset has an aesthetic that doesn't come across as incredibly "gamery," even if it still says Steelseries on the earcup. The construction is plastic, which is unfortunate for a premium headset, but the headband and ear cups are padded with thick cushions for ample comfort. A highly flexible microphone slots into one earcup, making it easy to position when needed and tuck away when not in use. You also get the wireless base station, which can connect to a PC via USB (and support Dolby 7.1 Surround audio) and to PS4 or Xbox One consoles with an optical cable. It also has 3.5mm audio-in and audio-out. Plus, a battery charging dock will let you charge one battery while using the other one in your headset. 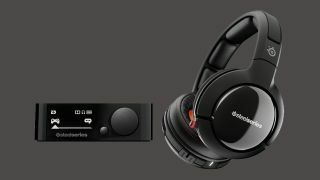 The headset itself can also plug directly into sound devices for wired audio. And, there's even an audio-out port on the headset that allows you to share what you're hearing with a second pair of headphones. The issue here is what the Siberia 800 is up against. The Arctis Pro Wireless is largely superior, but also costs a fair bit more thanks to discounted prices on the Siberia 800. However, step down to the Arctis 7, and you get a serious competitor at at a price point well below the Siberia 800. The Arctis 7 gaming headset offers wireless audio on the PC and PS4 using a USB port and a 2.4GHz connection. It lacks wireless support for the Xbox One, but can you connect it to an Xbox One controller with the included 3.5mm headphone cable. For single-player games, the Siberia 800 has the edge here, but to use voice chat in online Xbox One games, you'll be wiring the Siberia 800 headset to an Xbox One controller as well. So what else is different? The Arctis 7 uses DTS Headphone: X v2.0 for surround sound while the Siberia 800 has Dolby 7.1 Surround Sound. Both codecs deliver surround sound on PC, but DSS 7.1 is known for its distinguishable sound channels and DTS for its better balance. Other than that, the only notable downgrade is that the Arctis 7 doesn't come with a pair of swappable batteries that allow you to keep one charging while you're using the other. With the Arctis 7 on the market, we really don't see much reason to go ahead with the Siberia 800. The Arctis 7 offers plenty similar, and improves on the Siberia 800 in a few ways. All that, and it comes in at a price well below even the best Siberia 800 discount prices. That said, if you want the ability to connect the wireless base station to multiple platforms in your entertainment console at the same time, the Arctis 7 isn't up to the task. In that case, you'll likely be force to pick between the Arctis Pro Wireless and the Siberia 800. In this case, you can save yourself some money going with the older Siberia (though you'll lose out on the Arctis Pro Wireless's addition of Bluetooth into the mix). Of course, if you do start eyeing the Arctis 7 as a worthy alternative to the Siberia 800, it may be worth also considering the Astro A20 headset.